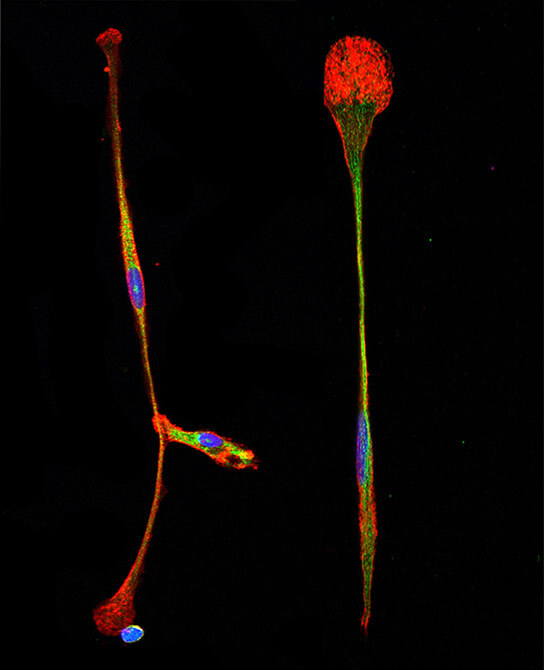 Scientists at The Scripps Research Institute have found a simple way to turn bone marrow stem cells directly into brain precursor cells, such as those shown here. Image courtesy of the Lerner lab, The Scripps Research Institute. While looking for lab-grown antibodies that can activate a growth-stimulating receptor on marrow cells, a team of scientists at the Lerner lab discovered a way to turn bone marrow stem cells directly into brain cells. La Jolla, California – In a serendipitous discovery, scientists at The Scripps Research Institute (TSRI) have found a way to turn bone marrow stem cells directly into brain cells. Current techniques for turning patients’ marrow cells into cells of some other desired type are relatively cumbersome, risky and effectively confined to the lab dish. The new finding points to the possibility of simpler and safer techniques. Cell therapies derived from patients’ own cells are widely expected to be useful in treating spinal cord injuries, strokes and other conditions throughout the body, with little or no risk of immune rejection. The researchers discovered the method, reported in the online Early Edition of the Proceedings of the National Academy of Sciences the week of April 22, 2013, while looking for lab-grown antibodies that can activate a growth-stimulating receptor on marrow cells. One antibody turned out to activate the receptor in a way that induces marrow stem cells—which normally develop into white blood cells—to become neural progenitor cells, a type of almost-mature brain cell. In the late 1980s, Lerner and his TSRI colleagues helped invent the first techniques for generating large “libraries” of distinct antibodies and swiftly determining which of these could bind to a desired target. The anti-inflammatory antibody Humira®, now one of the world’s top-selling drugs, was discovered with the benefit of this technology. Last year, in a study spearheaded by TSRI Research Associate Hongkai Zhang, Lerner’s laboratory devised a new antibody-discovery technique—in which antibodies are produced in mammalian cells along with receptors or other target molecules of interest. The technique enables researchers to determine rapidly not just which antibodies in a library bind to a given receptor, for example, but also which ones activate the receptor and thereby alter cell function. For the new study, Lerner laboratory Research Associate Jia Xie and colleagues modified the new technique so that antibody proteins produced in a given cell are physically anchored to the cell’s outer membrane, near its target receptors. “Confining an antibody’s activity to the cell in which it is produced effectively allows us to use larger antibody libraries and to screen these antibodies more quickly for a specific activity,” said Xie. With the improved technique, scientists can sift through a library of tens of millions of antibodies in a few days. In an early test, Xie used the new method to screen for antibodies that could activate the GCSF receptor, a growth-factor receptor found on bone marrow cells and other cell types. GCSF-mimicking drugs were among the first biotech bestsellers because of their ability to stimulate white blood cell growth—which counteracts the marrow-suppressing side effect of cancer chemotherapy. The team soon isolated one antibody type or “clone” that could activate the GCSF receptor and stimulate growth in test cells. The researchers then tested an unanchored, soluble version of this antibody on cultures of bone marrow stem cells from human volunteers. Whereas the GCSF protein, as expected, stimulated such stem cells to proliferate and start maturing towards adult white blood cells, the GCSF-mimicking antibody had a markedly different effect. “The cells proliferated, but also started becoming long and thin and attaching to the bottom of the dish,” remembered Xie. To Lerner, the cells were reminiscent of neural progenitor cells—which further tests for neural cell markers confirmed they were. Changing cells of marrow lineage into cells of neural lineage—a direct identity switch termed “transdifferentiation”—just by activating a single receptor is a noteworthy achievement. Scientists do have methods for turning marrow stem cells into other adult cell types, but these methods typically require a radical and risky deprogramming of marrow cells to an embryonic-like stem-cell state, followed by a complex series of molecular nudges toward a given adult cell fate. Relatively few laboratories have reported direct transdifferentiation techniques. “As far as I know, no one has ever achieved transdifferentiation by using a single protein—a protein that potentially could be used as a therapeutic,” said Lerner. Current cell-therapy methods typically assume that a patient’s cells will be harvested, then reprogrammed and multiplied in a lab dish before being re-introduced into the patient. In principle, according to Lerner, an antibody such as the one they have discovered could be injected directly into the bloodstream of a sick patient. From the bloodstream it would find its way to the marrow, and, for example, convert some marrow stem cells into neural progenitor cells. “Those neural progenitors would infiltrate the brain, find areas of damage and help repair them,” he said. While the researchers still aren’t sure why the new antibody has such an odd effect on the GCSF receptor, they suspect it binds the receptor for longer than the natural GCSF protein can achieve, and this lengthier interaction alters the receptor’s signaling pattern. Drug-development researchers are increasingly recognizing that subtle differences in the way a cell-surface receptor is bound and activated can result in very different biological effects. That adds complexity to their task, but in principle expands the scope of what they can achieve. “If you can use the same receptor in different ways, then the potential of the genome is bigger,” said Lerner. In addition to Lerner and Xie, contributors to the study, “Autocrine Signaling Based Selection of Combinatorial Antibodies That Transdifferentiate Human Stem Cells,” were Hongkai Zhang of the Lerner Laboratory, and Kyungmoo Yea of The Scripps Korea Antibody Institute, Chuncheon-si, Korea. Be the first to comment on "Antibody Transforms Bone Marrow Stem Cells Directly into Brain Cells"